Now I don’t usually like to share images of blood with my readers, but there is a related story and handy-dandy hint that I would like to share! Once upon a time there was a young girl straight out of tech in her first job in the rag trade – me! I had landed a role as a design room assistant – that is not a design assistant, it is a design room assistant, which means you are the design room’s general dogsbody. Anyway I slaved away thinking how lucky I was – sewing on buttons, pressing, fusing, making tea, doing buttonholes, etc. And later on if you were very lucky you’d be entrusted with grading and making patterns! While we worked we’d chat, and Pat would chat the most. I liked Pat – even though I was the junior she cared enough to call me Head Finisher! 45 years my senior, she shared with us stories about everything – history things like going to the dances at Orange Hall and flirting with the American soldiers based here during the war, fashion things like the fabulous Gown of the Year shows in the 1960’s, and mediocre things like how to get blood out of your fabric. 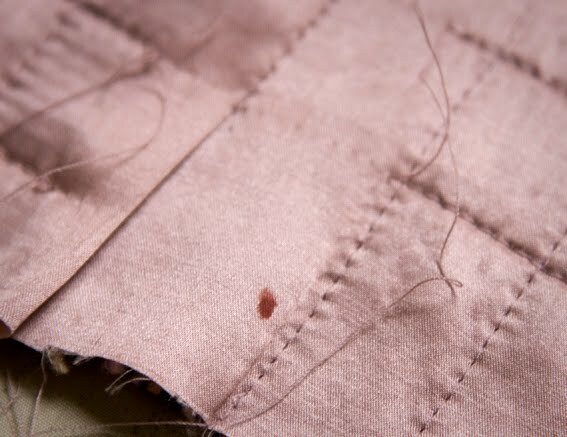 Now I never had much use for getting blood out of my fabric because I used to machine sew everything – in the garment industry you never handsew anything if it can be done by machine! But that was before I started to make wedding dresses, where handsewing became quite necessary and commonplace with all that lacework, ruching, catchstitching interlinings, and beadwork and stuff. But one day I had my Sleeping Beauty moment – the wicked fairy waited until I was attaching the final few crystals to a gown, when I pricked my finger and got a teeny tiny drop of bright red blood on the centre front bodice of the very white dress when the client was due for her final fitting within the hour. At that moment I kind of wished I was Sleeping Beauty and would just die or go to sleep for 100 years. But instead I did what Pat had told me to do – I spat on it! Well actually, Pat’s more elegant method was to moisten a small piece of cotton with your saliva and gently dab the bloodspot, but I had no time for that! Desparately I put the silk straight into my mouth and soaked it with spit – and miraculously it faded. I repeated this and soon it totally disappeared – no ring marks, nothing, just like magic! I breathed a massive sigh of relief, secretly thanked Pat-my-new-fairy-godmother, and the bride never suspected a thing. Admittedly using spit to remove blood sounds a bit gross and rather like an old wives tale, but there is a scientific basis – the enzymes in your saliva break down the blood proteins to remove the stain. Apparently your own saliva works best on your own blood – I haven’t tried anybody else’s and I certainly don’t intend to either! And of course the sooner you can remove it the better. So hopefully you’ll never need it, but Pat’s handy hint is here in case you do, and it definitely works. Maybe it could save your day one day, just like it did mine! PS: When the bride did arrive and try on her dress, my heart skipped another beat as I noticed another mark on the back of the dress – upon closer inspection it was a spider caught between the layers of chiffon!! If I was the bride I would have screamed, but her mother was actually pleased with the presence of a spider, claiming it was a sign of good luck and that her daughter would have a happy married life. Now I had never ever seen a spider in my workroom before, and never have since, so I thought maybe a little bit of spider luck was on my side that day too – don’t you? Ooo.. nice tip! I'll have to keep this in mind! What an excellent tip! I consider a formal a success if I don't prick my finger and get a spot of blood on the dress. I have always grabbed the peroxide but this sounds so much quicker and easier. I have also heard that a finger pricked drop of blood by a happily married sewist on the bride's dress would mean a happy marriage. Of course, not on the front of the dress! I do remember that even the seamstresses at Chanel did this. It's in the series “Signé Chanel”, so your jacket will be truly Chanel-style, even in solving problems. Okay, yeah, my heart just skipped a beat at that first picture! Thank you for the tip and I'm glad the jacket is back in pristine condition. 🙂 It is looking really lovely. SO gross, but it totally works. When I was nutty enough to hand-stitch my first quilt (queen sized. Never again), I had to spit ALL over it. I'm glad I'm not the only one! Can't wait to see your jacket as it gets closer to finished! I heard this tip somewhere just before I started making my sister's wedding dress, from silk she'd sent over from London, and in the week and a half between her and her fiance arrivng in Dunedin from London and their wedding. (Yeah, no pressure!) Yep, needed it. Lots of hand sewing and I pricked my finger. It's one thing hearing a tip, no matter from how trusted a source. It's quite another to see the blood magically disappear from ivory silk! Making a Chanel jacket the traditional way was always going to involve blood, sweat and tears, now we know it means, literally. I had a very similar experience with a silk chiffon brides maid dress I was making EXCEPT that I couldnt quite trust myself and left it for too long while I researched the solution . It did come out with my saliver but not as well as if I had done it straight away. Luckily it was in a less obvious place and the bridesmaid didnt mind too much anyway. Your quilting is looking good . When I did my jacket I stopped the seams about 3 cm away from the seamlines and edges and then pulled the thread through to the inside and tied them off . This means that all the business was happening between the silk linning and the tweed. Apparently when there wasnt a checked pattern on the tweed Chanel did rows of machine quilting which stopped short of the edges and seams , , sewed the tweed seams together by machine and then did all the lining seams by hand. There was a great artcile in Threads about how to do it with much less work and I think that entailed bagging out the tweed with the lining and then mounting the seams of the lining onto the seams of the tweed and stitching in the ditch and then doing supplementary quilting on each jacket piece . The sleeves were sewn in fully lined and then the armhole seam bound. But its the journey that counts isnt it ? ~Sigrid – a job in the Chanel workroom would be nice – at least they won't be shocked at my gross habits! ~Mary Nanna – No tears yet, but I am only up to the back! ~Mem – Thanks for that – I was wondering how to manage the lining around the armhole with the quilting factor! I thought of cutting the underarm lining higher, but then it gets complicated and could end up wonky, so I think I will bind it as you suggest. 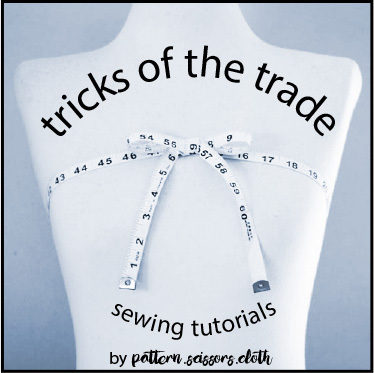 The Threads method sounds interesting, I might give that a go when I choose a plain fabric with no checks to match up! I read that quilting would cause the panels to shrink so I have cut them after quilting, but I don't think they have shrunk much – it would be much easier to quilt after assembly! You know, dahling, I absolutely adore this post! Brava! Oh my god, GREAT tip. I stab myself all the time while handsewing, I must be terribly uncoordinated. Thanks for this! ps. So true, whenever you start in the garment industry it's far from glamorous! Great story and very handy tip – thanks for sharing. Could be that Kiwi's have the best handy hints – Grannie rubbed butter into dirty grease stains until they disappeared. :-). As an alternative, a nurse roomate taught me to use hydrogen peroxyde..
Wow, that was quite the story. I'll have to try that saliva technique some time as I have often shed blood on my sewing projects. On another note… I am a Mother of the Bride in one week. I purchased a top to go with a long mermaid skirt I had from another of my children's weddings and it looks awesome. Only problem is… the back buckles between the neck and waist. It is a peplum style with a waist that is definded and a self tying wide belt, so there is not a lot of room for lowering it (it's actually tight at the hips). My hubbie says it looks fine, but I just know it's “puffy” and folding above the belt. How can I adjust this in a matter of days. I am quite good at sewing but am wondering if I should just see a tailor. Is there an easy fix? I could have actually used a size smaller for the top but the hips would not have fit. ARGHHHH it's the only thing I found! HELP!